You may be in a hurry to sell your Santa Barbara home this summer, or your house may already be on the market in Montecito but doesn’t seem to be getting any attention. You think you’ve done everything you can to get your house ready to sell, but is there something you might be missing? As an experienced Montecito real estate specialist, I know that it can be difficult balancing your needs as a home seller while trying to attract qualified home buyers. Look At Other Homes That are Selling: Find out how well your home stacks up against the home selling competition. Attend open houses for properties in a similar price range as yours and get ideas you can use to make your home more appealing. If your house doesn’t measure up, consider a few minor improvements like a fresh coat of paint, removing old carpeting or planting some flowers. Get Better Pictures: The first place most home buyers stop for information on potential homes is online. If your home doesn’t come across well in the pictures, they are not going to drive by, set an appointment, or attend an open house. It might pay to invest in a professional photographer or videographer who knows how to make your home look more appealing online. Listen to Your Realtor: While some home owners can be very competent supporters in the home sale process, it is usually best to listen to the advice of an experienced realtor. Ask: If you’re open to the possibility that you might get some tough insights, ask prospects who viewed your home why they decided against buying it. Whether you are selling a home in Montecito, thinking about buying a home in Santa Barbara, are interested in Goleta homes for sale, or want to learn more about foreclosures and short sales, contact our Coldwell Banker real estate office and let us make the whole process easy and stress-free. If you decide to buy your Santa Barbara home through me, be sure to ask about my monthly special where I will pay for your Home Warranty for one year, up to $500, if you open your escrow with me during the month of July. Spirit of ’76 Parade: The parade will take place on Friday July 4, with a grand march beginning at 1:00 p.m. at Micheltorena Street and proceeding down State Street to Old Town Santa Barbara, concluding at Cota Street. Over 175 nonprofits will participate, with this year’s parade theme focusing on safeguarding our nation’s Bill of Rights. 4th of July Fireworks Display: The City of Santa Barbara will again host the traditional beachside Independence Day fireworks show on Friday, July 4. Food vendors will be at the West Beach waterfront from 11am – 9pm, so bring a picnic blanket and set up for a fun day at the beach! The fireworks show will start at 9pm and will last for 25 minutes; West Beach is open to the public during the day’s festivities. Free Concert at the Courthouse Sunken Gardens: Don’t miss this free concert of inspiring and patriotic American orchestral masterpieces presented by the West Coast Symphony Orchestra at 5pm Friday, July 4th in the historic Santa Barbara County Courthouse Sunken Gardens. The early performance will allow plenty of time for dinner downtown, and a walk to the fireworks show off Santa Barbara Harbor. The concert is made possible by the support of the Cielo Foundation for the Performing Arts. Butterflies Alive! : Experience the magic of Butterflies Alive! at the Santa Barbara Museum of Natural History as you stroll through a beautiful garden filled with flowers, luscious greenery, and hundreds of free-flying butterflies. See one of nature’s most beautiful ambassadors and reconnect with nature. Entrance into the exhibition is included with Museum admission. About Barbara Reaume – Barbara Reaume is a professional Santa Barbara realtor for Coldwell Banker, with over thirty years of experience. As one of Montecito’s top realtors, people who want to sell or buy a home in Santa Barbara seek out her advice on buying a single family home, finding a condo, or purchasing land as an investment. Visit the website and Facebook page or call 805-610-5403 for more information or to request a quick quote. Check-out the properties below to see! Selling real estate in Santa Barbara is tough without the help of a Realtor. Suggestions such as re-painting and de-cluttering should be taken into consideration as appearance always influence buyers aside from the location and other factors. Thanks for the suggestions Barbara. Tip#4 Listen to your Realtor – I would just like to emphasize the importance of partnering with the right real estate expert to get the most of your transaction whether selling a home in Montecito, thinking about buying a home in Santa Barbara, or looking for Goleta homes for sale. Other than enjoying optimal savings or profit, your Realtor saves you from all the stress of going through such undertakings for business or personal investment. So when buying or selling real estate, partnering with a local and trusted Santa Barbara Realtor definitely ensures a win-win deal. 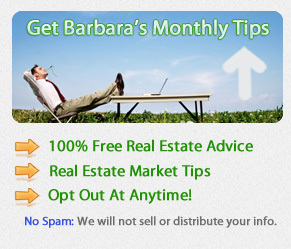 These are very useful tips when wanting to sell your Santa Barbara home. The downloadable “10 Ways to Increase the Value of Your Home” gives home sellers ideas to invest in to make their Santa Barbara homes more attractive to prospective buyers without breaking the bank. Everyone wants to get the most out of selling a home, and homes that aren’t selling as soon can be frustrating especially for those planning to move and transfer into another neighborhood. When this happens, the best thing you could do for yourself and your home is to contact a Santa Barbara real estate office. This can make the home-selling process easier and faster. I agree with Tip # 3. Nowadays, social media sites prove to be very effective in advertising almost anything. In order to stand out, impressive pictures of your Santa Barbara home must be uploaded. And of course, if it has been noted that your house isn’t selling no matter how beautiful your pictures are, it is now necessary to consult a Santa Barbara realtor.